Pinawa’s section of the Great Trail, formerly known as the Trans Canada Trail, spans 27.5 kilometres, from the Seven Sisters Falls Hydro Dam in the south, to the historic Old Pinawa Dam Heritage Park in the north. 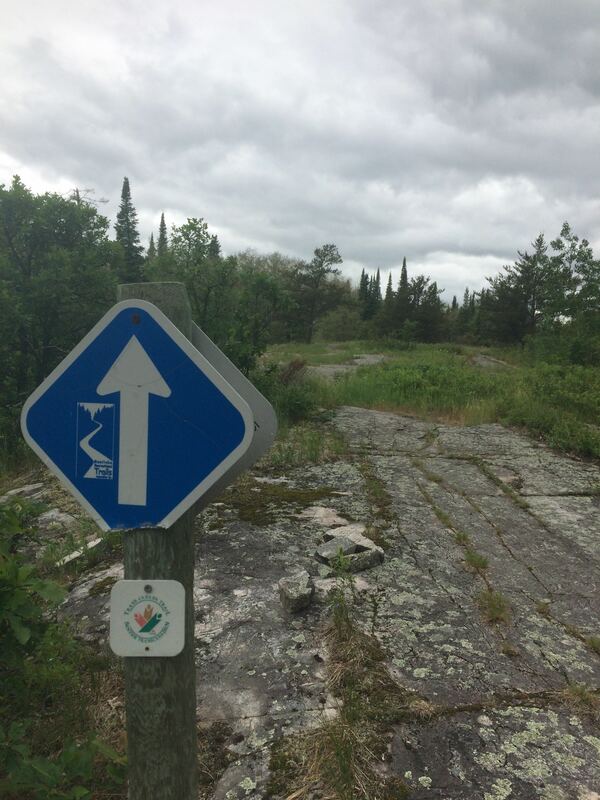 The trail travels through boreal forest and over granite outcrops of the Canadian Shield. 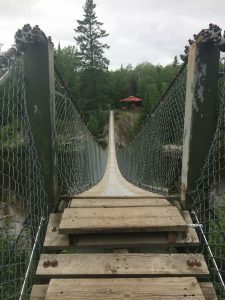 Along its length it follows both the Winnipeg River and the Pinawa Channel, and connects the communities of Seven Sisters Falls and Pinawa. It is a part of the Border to Beaches trail that runs from West Hawk Lake to Grand Beach, and it connects the North Whiteshell and Blue Water sections of the Trans Canada Trail. Services available along the trail include restaurants, camping, motel, hotel, grocery store, a beach, pool, tennis, golf course and more. Yesterday I had the pleasure of hiking the entire length of this spectacular piece of the Great Trail. My day began at 9:30 AM on the south side of the Seven Sisters Falls Hydro Generating Station. Tucker and I walked over the dam and followed the trail along the berm that skirts the Winnipeg River. 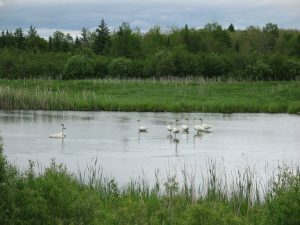 Look for loons, Canada geese, pelicans and other marsh birds. At 5.5 km the trail turns into the forest, but is still a beautiful 2-tracked trail, perfect for hiking or cycling side by side with your companion. Over the next 2 kilometres the trail narrows, the track softens and the grass closes in. We startled a coyote here that sprung right across our path. At 6.8 km there is an exit to Hwy 211. Take this in an emergency but expect to encounter water, mud and uncut grass. 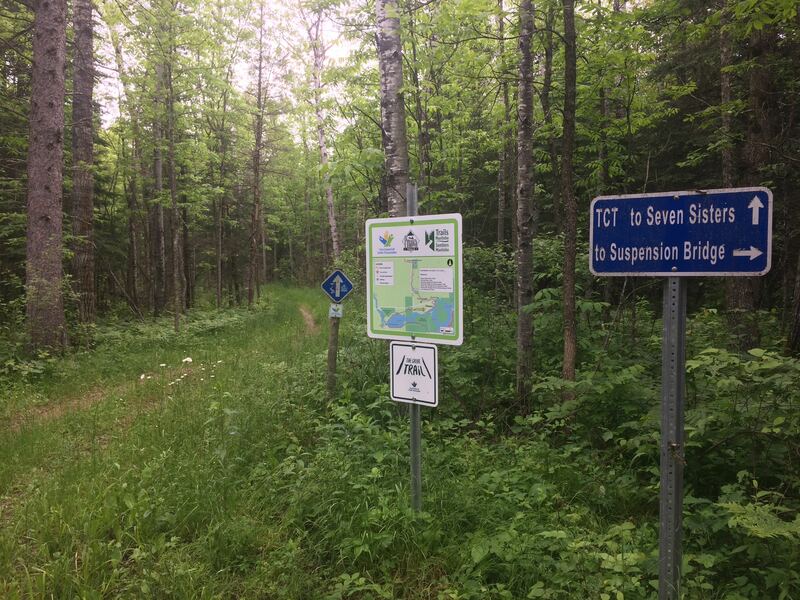 Be sure and follow the Trans Canada Trail signs here. There is also a winter trail for snowmobiling in the area that is wet and not maintained in the summer, and you don’t want to wander on to it accidentally. The proper trail continues 1.5 kilometres to the Pinawa lagoons (8.3 km). At 9.4 km we reached a fork in the trail. 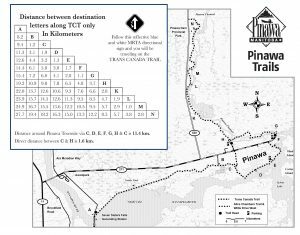 We could turn left and proceed directly to the Suspension Bridge, by-passing the town of Pinawa and missing almost 10 km of riverside trail, and all the services Pinawa has to offer. We continued on to Pinawa. 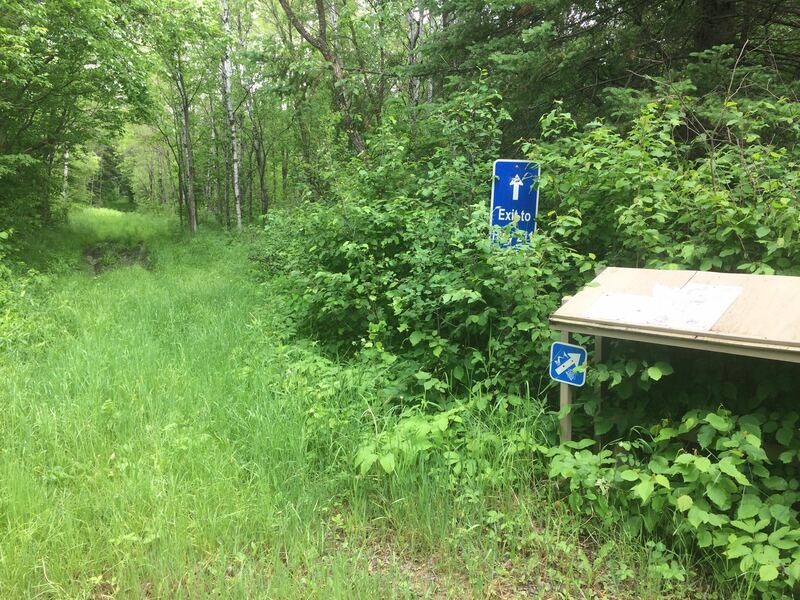 The Pioneer Bay Campground, at 10.3 km, is essentially a seasonal campground but does offer 8 transient sites which could be a wonderful place to spend the night if you’re passing through on the Great Trail or the Border to Beaches. 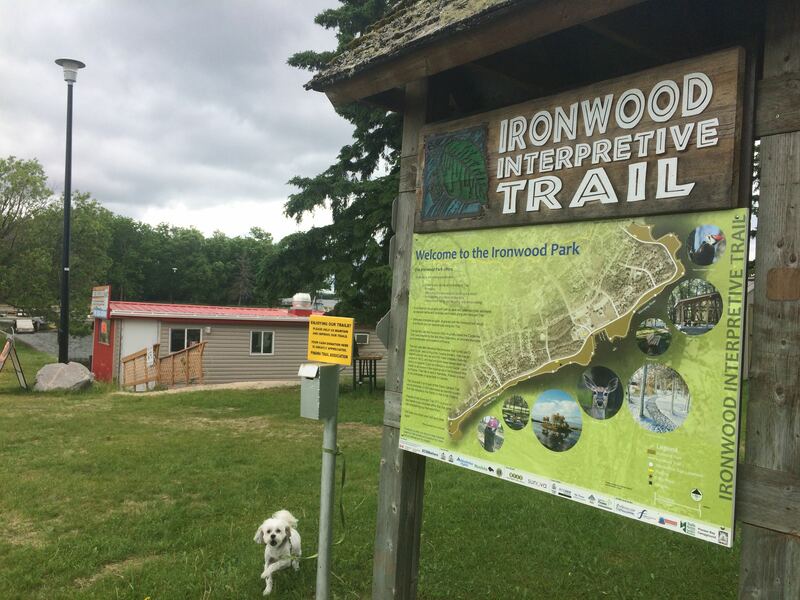 This is also the start of the Ironwood Trail, a busy section of town trail used by over 40,000 people a year. Just steps past the campground, the Winnipeg River comes back into view, and the trail hugs it for the next 5 km. Scan the far side of the river for the eagle’s nest at the top of one the pine trees. 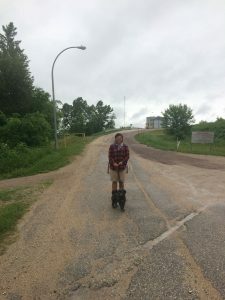 Tucker and I are now walking through residential Pinawa – the beautiful Winnipeg River on our right, and Willis Drive and homes to our left. Watch for the plentiful number of deer grazing along this section and if you’re lucky you may spot otter and beaver swimming. Notice the trees wrapped with chicken wire – that’s to keep the beavers from their busy work. After 2 hours and 45 minutes we arrive, 12.4 km, to downtown Pinawa. Hunger has set in and we have a choice of restaurants. The Burger Boat is conveniently located right on the trail at the Pinawa Marina and the Solo grocery store (in the mall) sports a deli with seating. We chose the Burger Boat and Tucker and I shared some great fish and chips. Marlayna is the owner of the Burger Boat and you can give her a call for hours or to pre-order at 204-753-8249. There are a few options for bedding down for the night here as well – the Wilderness Edge Resort, the Pinawa Motel or Deer Ridge cabins. The two port-a-potties here might also be a welcome sight by this time. After lunch Tucker and I continued past the Marina and Sailing Club. At 14.3 km we passed the recreational centre of Pinawa – the beach, pool, tennis court and golf course. Keep your eyes open for snapping turtles. There’s another great restaurant here at the golf course, as well as flush toilets and running water at the beach (in the summer months only). 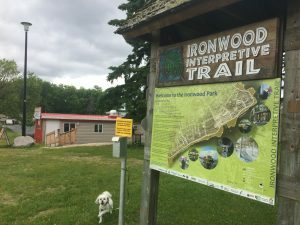 This marks the end of the Ironwood Trail. Tucker was tuckered and had to go home for a nap, so I continued on by myself. From here the trail link can be a little tricky to find. Walk up the length of the golf course parking lot and look for the TCT trail signs on the golf cart track that runs along the west side of the 10th fairway. The trail takes you up to Hwy 211. Turn east and follow the highway for about 500 metres to the end of the cul-de-sac. 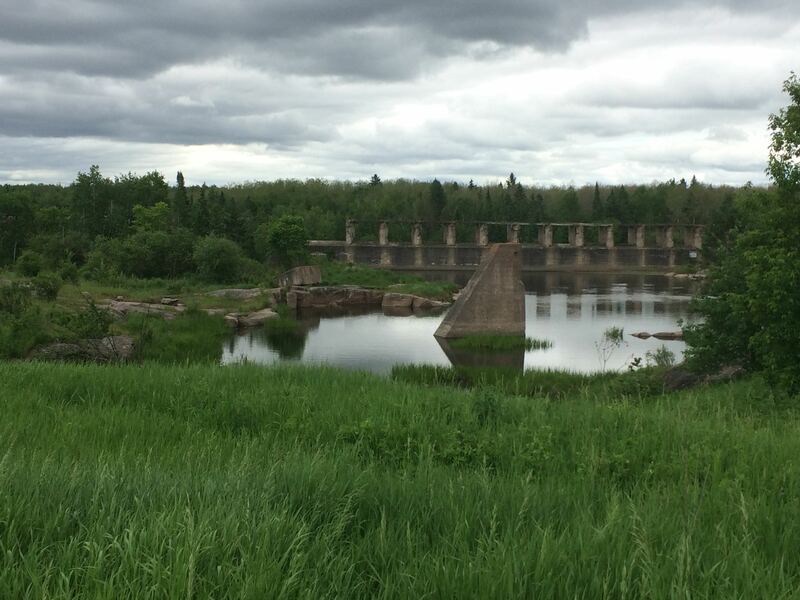 Cross over the Diversion Dam – the scenic Pinawa Channel on your left and the entrance to Crater Lake on your right. 15.3 km and 4 hours to this point, 45 minute lunch stop included. At the far side of the Diversion Dam follow the TCT signs on your left. If there is any section of the trail you could get lost on, the next stretch to the Suspension Bridge is it. There are several trails in here – skiing and cycling – follow only the blue and white signs and you’ll be fine. I call this the wild and wonderful section of our trail. Although the trail follows the Pinawa Channel, you hardly ever even get a glimpse of it and you feel like you are deep in the forest. 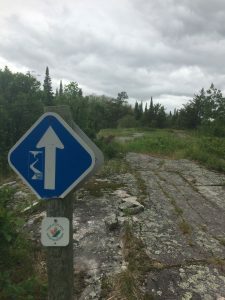 There’s plenty of granite outcrops – follow the cairns if you don’t see a trail sign. Watch for bears and grouse. At 19k and 5 hours arrive at the Suspension Bridge. The last port-a-potty is just up the trail from here. From the Suspension Bridge trail turn right and pass the yellow barrier on the Alice Chambers Trail. Follow this soft two-tracked trail for the next 2.5 kms. This is another great stretch to walk or cycle side-by-side, but do use some caution as this stretch is shared with ATV traffic. The odd contraption you pass at 21.5 kms is a rice boat. A glance at the Channel here makes its use obvious. At 21.7 km turn north off of the Alice Chambers, crossing bridge # 1. The next 7 kilometres follow the Pinawa Channel. There are some scenic rapids at 23.7 kms. Cross bridge #2 at 24.7 km and enjoy a nice rest stop on the granite outcrop beside the channel at 25.2 km. 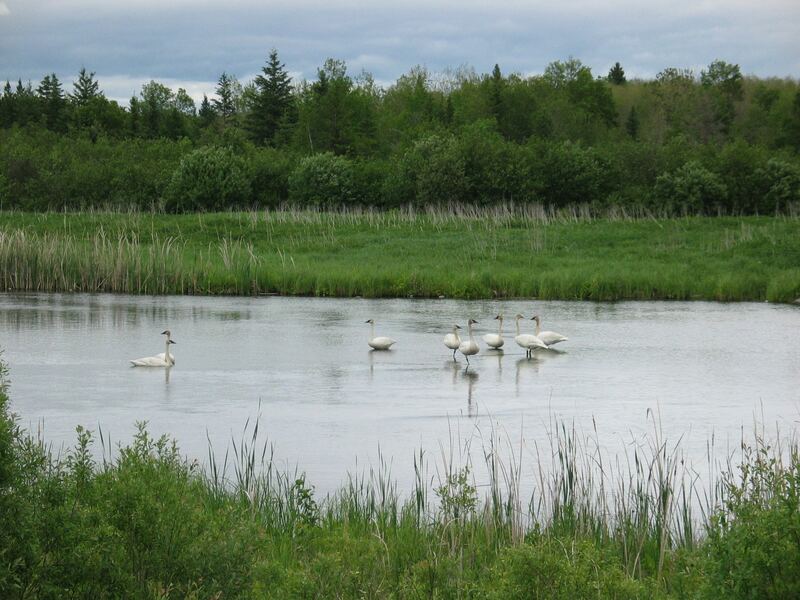 Around 27 km look for some resident swans in the Channel, then cross bridge #3 at 27.3 km. You are now walking through tall grass and should begin to see the ruins of Old Pinawa in the distance. You arrive almost abruptly, at 27.5 kms in the parking lot of the Old Pinawa Dam Heritage Park. Total time 6 hours and forty minutes. Hopefully you’ve save some energy to explore the ruins because the trail has by-passed all of them. The flat rocks and picnic benches make this an excellent rest stop. Explore the ruins and enjoy a refreshing swim. 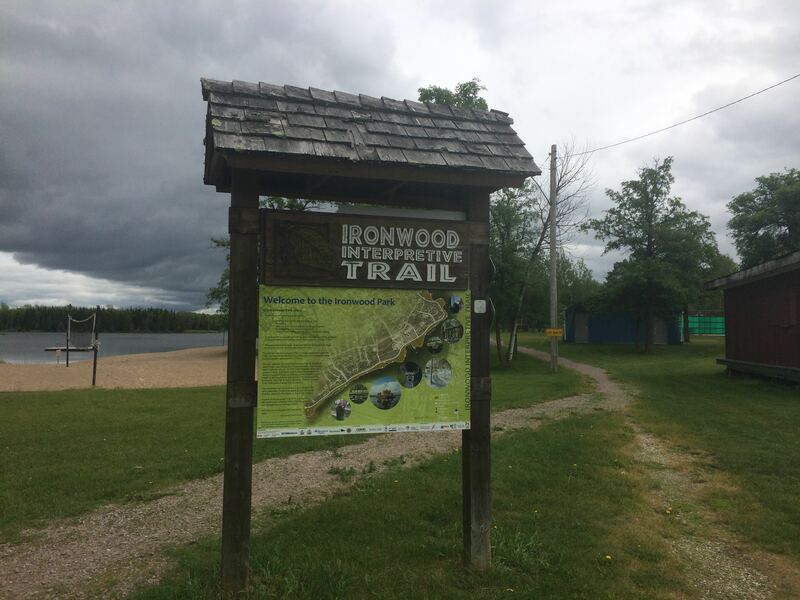 You have just completed Pinawa’s most magnificent Great Trail. Great site, Donna! I especially like the photo of Ray enjoying his lunch. Yes, I think it should be our regular go-to TCT site. I’m sorry I missed the celebrations. When you formed the “Friends of the TCT” you took on a lot of the responsibility for the trail that had been mostly Marsha and me with a lot of other volunteer help to build and maintain it. Thanks for that! Some of the pics you posted of various spots along the trail look very overgrown. 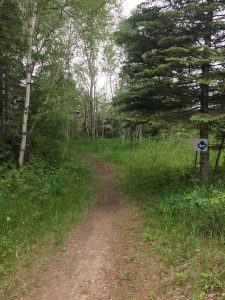 Has trail maintenance not been kept up? Every step of the trail was freshly mowed and in great condition by our TCT event on August 26th. 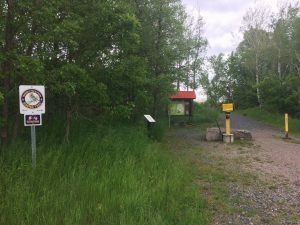 While there have been some trials with construction and ATV use – there are some very dedicated volunteers that maintain the trail all year long. I’m also sorry you missed our event – I was hoping to see you. You are one of the founders of our trails. Marsha mentioned you in her speech. Thank you for your detail! I hope to do this trail (IN sections) this fall! I do have a question, where do you park your car at start (the seven sisters Gen station)? Yes, There is parking available on the south side of the river at the Generating station. Hi there there i hope you are open to questions. 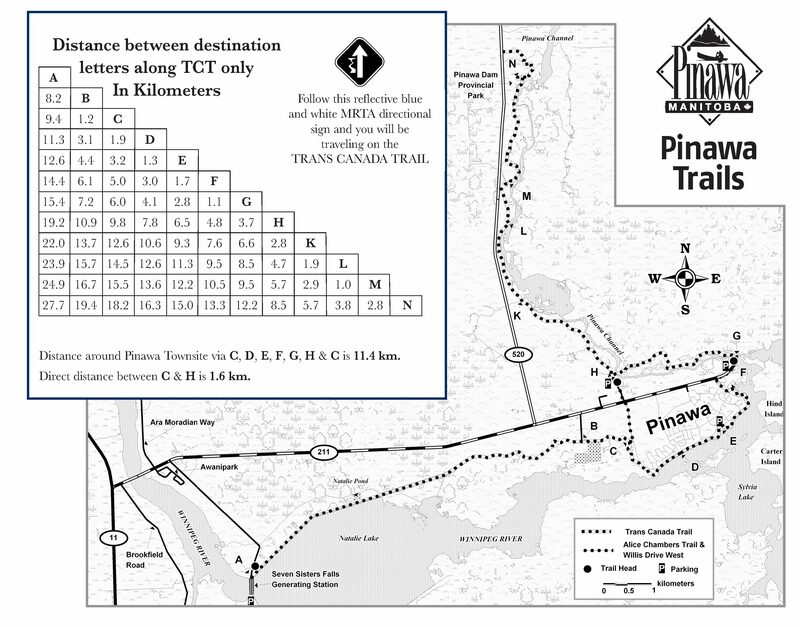 I am from Thunder Bay, planning to do a trip to manitoba, i just read your blog on this portion of the Pinawa Trail. i am more of a cyclist, but i ask would it be possible to ride most of the 27.5 km of trail on mt bike? with some hike a bike ? would it be ok for mid june? any problems with ticks? bugs i should consider of? The entire trail is cycle friendly for sure with a mountain bike, no problem. If you’re coming in June I’d say bring bug spray – that also keeps the ticks at bay. They are less of a nuisance when you’re riding any way. You won’t be completely alone, but there are sections of the trail where you’ll certainly feel like you are. 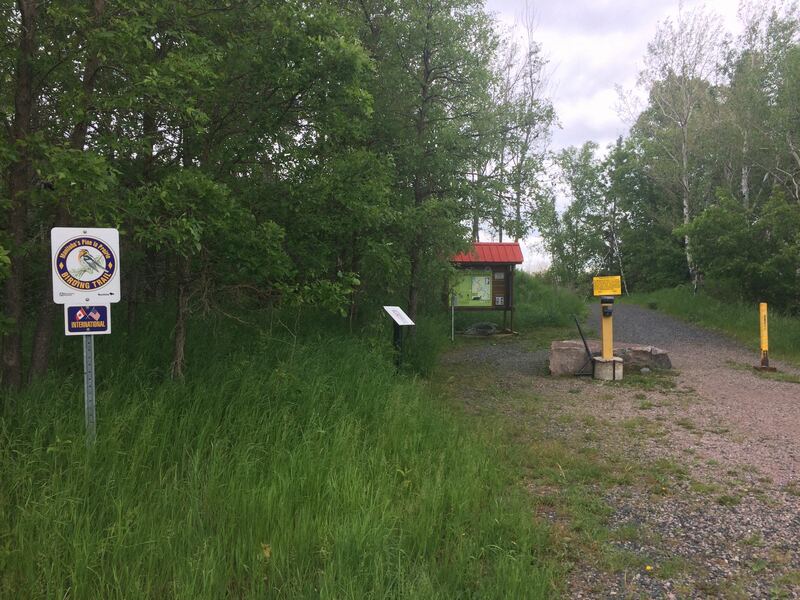 When you reach the trail through town there will be a few dog walkers and hikers and cyclists. It’s a nice mix. I don’t think there’s a better side to start at but there are a few restaurants to enjoy in Seven Sisters of that’s you’re kind of thing. It is a one-way trail but on a bike you could probably cycle back to your vehicle via the highway if necessary. Hope this helps and hopefully I’ll run into you on the trail somewhere! Thanks. That’ll add a lot of driving. 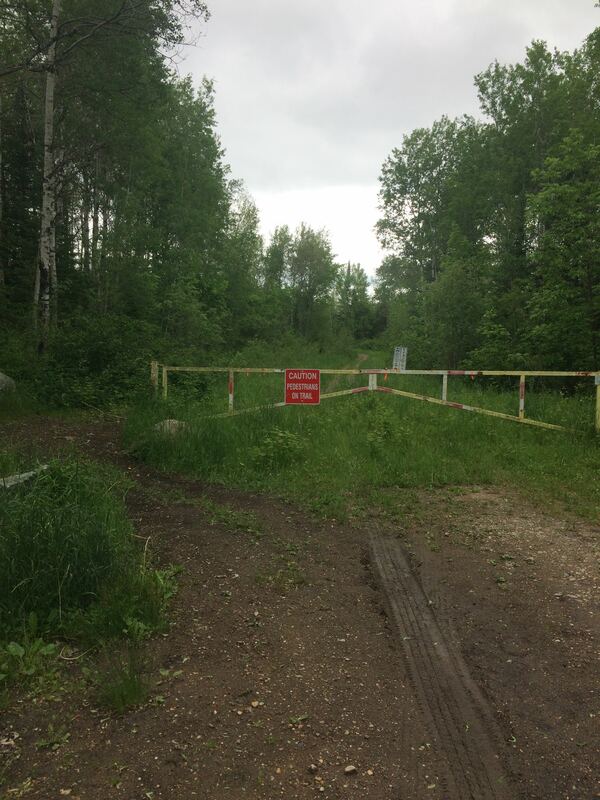 We’ll be coming from lac du bonnet so prefer to find a place to park on the north side of dam (pinawa side of the dam). Any other places that looked possible?